Aam Papad is one of the favourite dish for all which you can have at any time when you want to eat something sweet. Some can give a twist & make this with little spicy by adding slight green chilly paste but the actual aam papad is always sweet. 1. Peel the mango and chopped all the mangoes. 2. Blend the chopped mangoes to make a smooth pulp. 3. Take a pan and cook the mango puree with sugar. 4. Cook the puree until it starts to coat the pan on side. 5. Grease a plate with oil so that aam puree will not stick into it. 6. Spread the puree now in the plate and move the plate lightly to smoothen it out and equally spread all over the plate. Spread the melon seeds on top. However, I did not use melon seeds. 7. 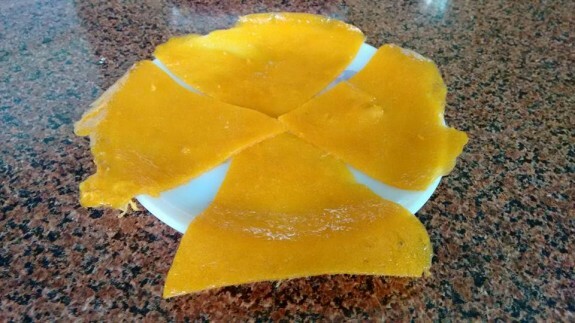 Allow the aam papad to dry well until the side edges of the aam papad starts to loosen up and the puree gets dried. Now with the help of a knife, loosen the edges and peel off the aam papad from plate. 8. Cut it into small pieces or as desired shape.